Techreport.com posted earlier today that there's currently a $100 rebate from Microsoft on the Surface Pro. That brings the price of the 64GB SSD model to $799 and the 128GB model to $899, though still without a Type Cover sadly (add another $129 for that). The rebate is set to run through August 29, or "until supplies last", but it seems more like a way to clear inventory in preparation for the launch of a Haswell based Surface Pro 2. In our review of the Surface Pro six months ago, we concluded that it was one of the best executed tablet/laptop (taptablet, Ultra-tablet, etc.--feel free to make up your own name for this class of device) computers we had seen. The inclusion of an active stylus also opens the door for other use cases--Penny Arcade's Mike Krahulik for instance loves his Surface Pro and it appears he has switched to using that for many of his comics. The two primary concerns with the original still remain, however: you don't get the Type Cover as part of the core package (and $129 is an awful lot for a cover that doesn't include any additional battery life), and more importantly the battery life is pretty poor for a tablet--five or six hours in our testing, compared to 10-13 on many higher quality tablets. Now that the Haswell launch is behind us, we have a better idea of what to expect from the 4th Generation Intel processors, and most of what we expect is minor to moderate improvements in performance with dramatically improved battery life. So far, we've seen 6-13 hours out of the new MacBook Air 13, over eight hours on the updated Acer S7--nearly twice what the original S7 managed!--and even a mainstream laptop with a quad-core i7-4702MQ (and a larger battery) posted times of 4-9 hours with the MSI GE40. In fact, I've got an updated MSI GT70 with i7-4930XM and GTX 780M that's getting 4-6 hours in our battery life tests. When we look at power use of the Haswell ULT processors and consider what can be done with a 4.5W Haswell, the next Surface Pro could be a serious improvement over the original, at least as far as mobility goes. I'd still like to see Microsoft include a Type Cover in the package, as otherwise you're getting an already expensive tablet and paying a hefty sum to add laptop functionality. Improving the battery life and getting the prices closer to the current "rebate pricing" would seal the deal I think. We'll have to wait to see what Microsoft actually releases, but in the meantime, if you're in a hurry to help clear out the Ivy Bridge inventory, feel free to take advantage of the current offer. 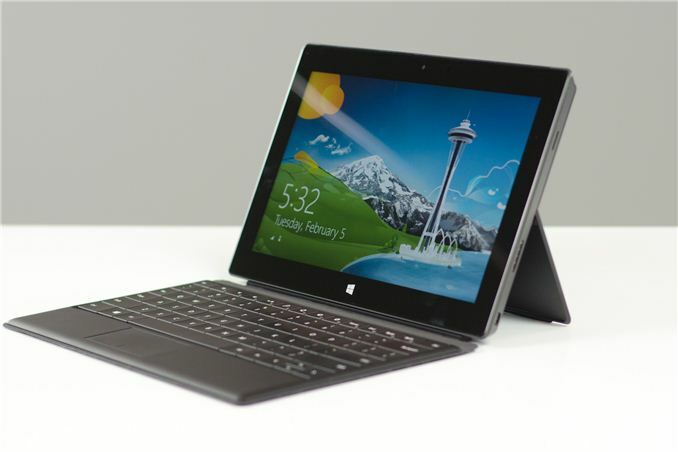 Just don't be surprised to see a newer, better Surface Pro in the near future. They need to hit 400$ with the cover included and since they can't do that ,they might as well not bother. Exactly. I always laugh at comments that say it should be priced around $400... i mean seriously? LOL wut?? It's an Ultrobook in a tablet form factor (or a Ultrabook that transforms). How the hell would it cost just $400? These people completely miss the WHOLE point of the device. They just don't need a Surface Pro, but they like the form factor and capabilities... This is where a non-RT Surface RT would really help Microsoft's mobile strategy, but I think we all realize Windows RT had to happen in order for Intel to wake up (and stop sandbagging Atom). The issue is not that the hardware "justifies" a price of $1000. The issue is: is there REAL demand for hardware of this type? The theory of the Surface Pro is that there is substantial demand for a tablet that, while it costs twice as much as a "normal" tablet, also has a very powerful CPU and can run Windows apps unaltered. I'm not seeing that demand. MOST of the use cases for a tablet are what we already know --- media consumption, web browsing, light email. There are interesting enterprise cases like sales terminals, medical terminals, or document archives. None of these require a hefty CPU, and most of them are not helped by being able to run Windows.